First bake the cake. For this, you'll need to preheat the oven to 180-200°C, depending on what kind of oven you have. You'll need the higher heat if you have a conventional electric oven. Grease four 8-inch cake tins, and line them with parchment paper. In a medium sized bowl, combine the butter, the sugar and the vanilla extract and beat them on high speed until the mixture becomes fluffy and of a creamy, pale yellowish color. Add the eggs in gradually and mix them well. Once its well mixed, add in the flour and baking powder gradually, and mix it gently. Pour the mixture into the four tins, and bake them for 20-30 minutes, then let them cool on a cooling rack. Their top sides could be domed, so cut the fluffly top parts off in order to get even and flat layers. To make the buttercream, mix the butter, the sugar and the vanilla extract. Take some of it aside, and use the rest for spreading the layers and covering the cake on the outside. To make the horn, cover an ice cream cone with the fondant. You can add some food coloring gel if you'd like to achieve a nice and bright color. Before placing it on top of your cake, you should let it set in a fridge for a few hours. To make the ears, roll our 100 g of the white fondant, and cut two ear-shaped parts out of it. Color and reroll the excess fondant, and cut smaller ear-shaped parts out, then attach the latter onto the while part. Using a little water can help you in this process. You can attach the ears onto the top of the cake using cocktail sticks. To make the rainbow-colored mane, pour some food coloring gel into a piping bag, then place some buttercream into it. Use the piping bag to make small roses of colorful buttercream aroung the ears and the horn of the unicorn. 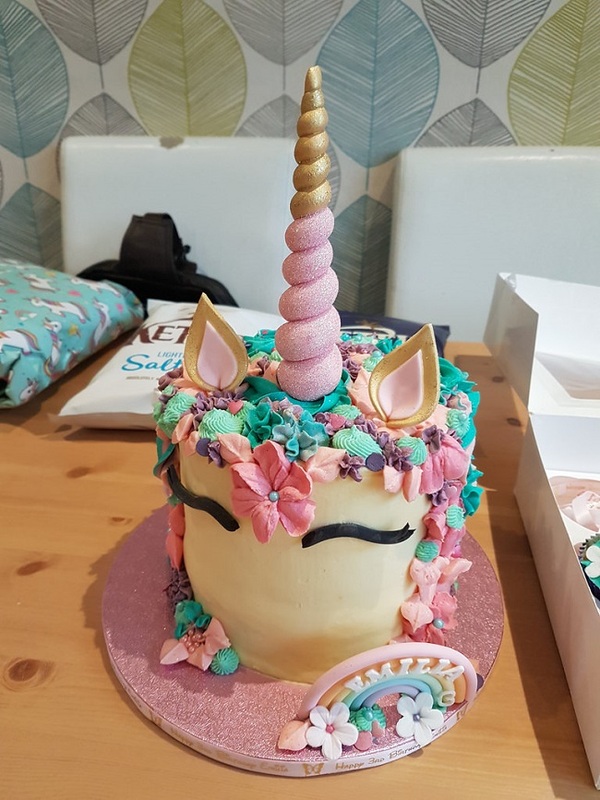 Finally, draw the eyes of the unicorn with colored buttercream.